Thursday November 14th 1889 We got up early for Will to go west so far west as Oxford to attend the Norah sale. he got home before seven in the evening and had bought one cow. Mother went to town to stay all night and attend the Carnival. Mr Pierce has a sister visiting him. It was a cold windy day. Friday November 15th 1889 We ironed some this morning and was all the forenoon getting the work done up. Mother came home about ten oclock. I went to town in the afternoon and down to the Court house to talk with Hatt awhile. I was at Hatties a little while, I got home at five oclock. I knit all the evening. Saturday November 16th 1889 We got up very early to have breakfast for some of the boys and Miss Pierce to go west. Mr Brown went home to stay over Sunday. As soon as we had dinner Will took me over to town to attend to some errands and then went down to Hatties. Mother and Lee soon came to go to the depot as they went to Burlington. I come home about four oclock and got the supper over. Will spent the evening at home. We went with Ott in the country and did not get home till late. finished husking Sunday November 17th 1889 We did not get up early and I was busy all forenoon with the work. I let Winnie go to church and got the dinner. In the afternoon Will and I drive out to Dentons for a call. When we got back Ott & Fan were here. They did not stay long. I wrote in the evening. The boys all stayed in the sitting room in the evening to talk. 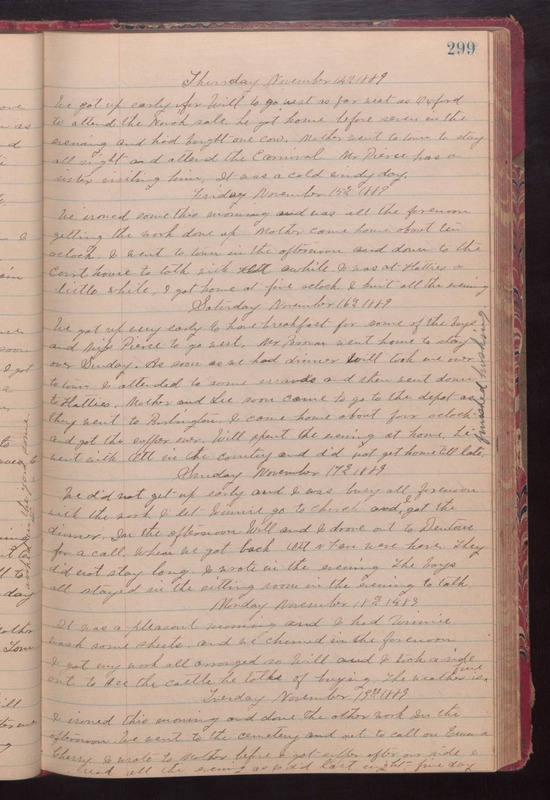 Monday Novemver 18th 1889 It was a pleasant morning and I had Winnie wash some sheets and we churned in the forenoon. I got my work all arranged so Will and I took a ride out to see the cattle he talks of buying. The weather is fine. Tuesday November 19th 1889 I ironed this morning and done the other work In the afternoon We went to the cemetery and out to call on Emma Cherry. I wrote to Mother before I got supper after our ride I read all the evening as I did last night. fine day.